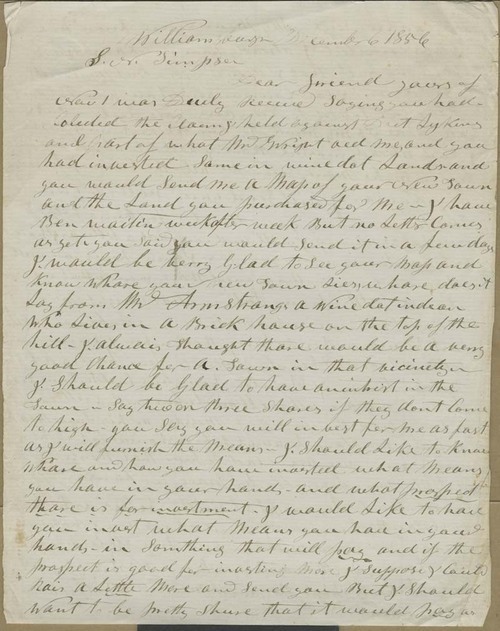 Hiram Hill wrote from Williamsburgh, Massachusetts, to Samuel Simpson in Kansas Territory, complaining to him that he had not received the map and information on the newly purchased Wyandotte lands Simpson was to send him. Hill expressed a desire to purchase two or three town shares if they were not too expensive, bringing the value of his investments in Kansas to almost half of his total worth. His aim, as he expressed it, was "first to make money, secondly help the Caus [sic] of freedom". Hill also communicated his dislike for President Pierce's recent statements, and that the free state supporters lobbying in Washington were having "pretty warm work."